The variability of the East Asian winter monsoon (EAWM) can be divided into an ENSO-related part (EAWMEN) and an ENSO-unrelated part (EAWMres). The influence of EAWMres on the ENSO-East Asian summer monsoon (EASM) relationship in the decaying stages of ENSO is investigated in the present study. To achieve this, ENSO is divided into four groups based on the EAWMres: (1) weak EAWMres-El Niño (WEAWMres-EN); (2) strong EAWMres-El Niño (SEAWMres- EN); (3) weak EAWMres-La Niña (WEAWMres-LN); (4) strong EAWMres-La Niña (SEAWMres-LN). 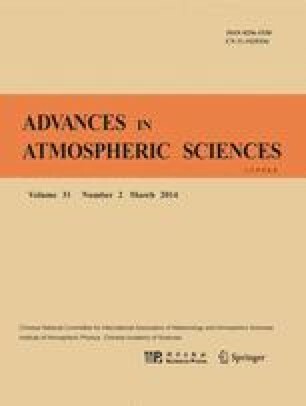 Composite results demonstrate that the EAWMres may enhance the atmospheric responses over East Asia to ENSO for WEAWMres-EN and SEAWMres-LN. The corresponding low-level anticyclonic (cyclonic) anomalies over the western North Pacific (WNP) associated with El Niño (La Niña) tend to be strong. Importantly, this feature may persist into the following summer, causing abundant rainfall in northern China for WEAWMres-EN cases and in southwestern China for SEAWMres-LN cases. In contrast, for the SEAWMres-EN and WEAWMres-LN groups, the EAWMres tends to weaken the atmospheric circulation anomalies associated with El Niño or La Niña. In these cases, the anomalous WNP anticyclone or cyclone tend to be reduced and confined to lower latitudes, which results in deficient summer rainfall in northern China for SEAWMres-EN and in southwestern China for WEAWMres-LN. Further study suggests that anomalous EAWMres may have an effect on the extra-tropical sea surface temperature anomaly, which persists into the ensuing summer and may interfere with the influences of ENSO. Zhou, L.-T., and R. G. Wu, 2010: Respective impacts of the East Asian winter monsoon and ENSO on winter rainfall in China. J. Geophys. Res., 115, doi: 10.1029/2009JD012502.